Imagine being tasked to make a Star Wars poster. How do you take everything you love about even one of the movies and boil it down to a single image? It’s possible, we’ve seen it, but one thing we rarely see is all three movies summed up on one poster. How would that even be possible? Well, you see how it’s possible above. We’re happy to exclusively debut the latest poster from Acme Archives and Bottleneck Gallery, the Star Wars Trilogy by the artist Gabz. And there’s good news. 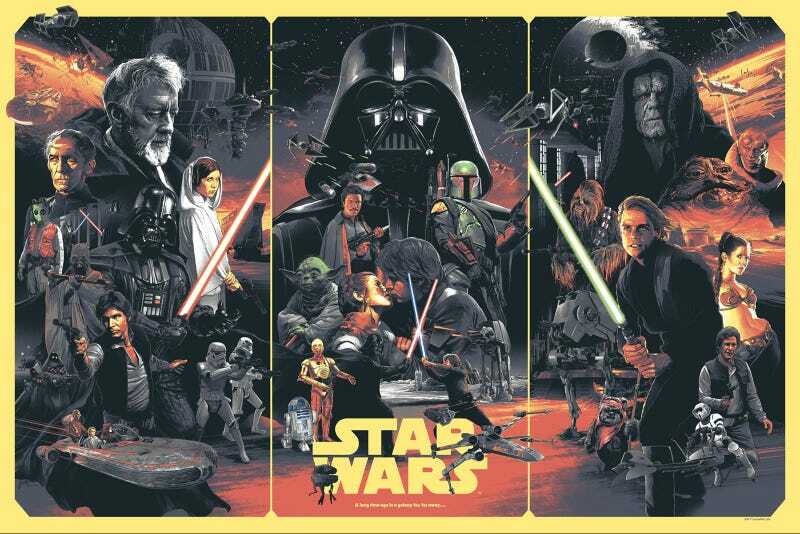 The officially-licensed poster has both a limited edition variant for super-collectors as well as a timed edition for everyone else who just wants to own that beautiful piece of work. Both the 7-color regular (seen above) and 6-color variant (seen below) 36 x 24 inch screenprints will go on sale at noon EST Thursday November 5 at bottleneckgallery.com. The variant is an edition of 225 but they’ll print as many regulars as people order through the weekend, ending at 11:59pm EST November 8. Regular costs $50, variant $65. I think it’s safe to say we do.